Harvard remained at top spot for the eighth consecutive year. Asia’s leading universities still lack the global standing that is enjoyed by many of their peers in the UK and the US, according to Times Higher Education’s list of the world’s most prestigious universities. 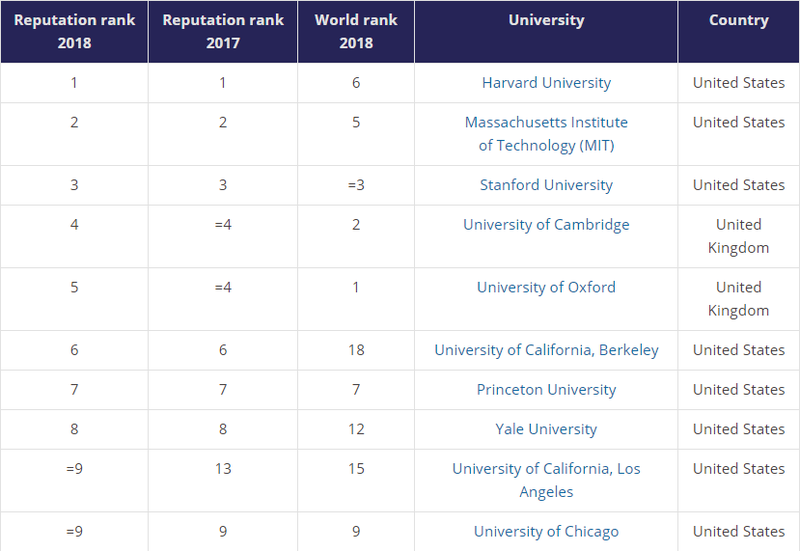 Analysis of the THE World Reputation Rankings 2018, which is based on a survey of leading scholars, shows that many Asian universities that make the top 100 list tend to get the majority of their votes from academics based within their own country – even though they have been rising up the THE World University Rankings in recent years. In contrast, North American universities on average receive just under half their votes from within their national borders, while European universities generally receive the vast majority of votes from outside their homeland. A separate analysis of individual institutions in the table reveals that even the most well-regarded Asian universities do not have high levels of prestige outside the continent. The University of Tokyo – the region’s top-ranked university, in the list at 13th place – received almost 80 per cent of its votes from within Asia. And while Tsinghua University, at 14th place, received more votes from North America this year, the majority of its votes (71 per cent) were again from Asian scholars. It is a similar story for both the National University of Singapore and the University of Hong Kong. In contrast, Harvard University – which took the number one spot for the eighth consecutive year – received just 26 per cent of votes from academics in North America, and similar shares from scholars based in Europe (27 per cent) and Asia (38 per cent). The University of Cambridge (fourth) also received a relatively even spread of votes by region, although, in continental Europe, universities still tend to draw their strongest support from within their region. The overall rankings results show that several Asian universities have slipped this year. Half of China’s six representatives and four of Japan’s five institutions have dropped places. Simon Marginson, director of UCL’s Centre for Global Higher Education, said that the regional difference in voting patterns can be explained in part by the fact there is a lag between “improved real performance and the reputational effects it generates”. The top research universities in the US and the UK “earned their reputations over the whole 20th century and beyond and have not slipped in standard, so they are difficult to displace”, he said, whereas universities in South Korea and Singapore “only really showed themselves as strong in the 1990s, and China’s rise is essentially post-2000”. The World Reputation Rankings are based on an invitation-only opinion survey of senior, published academics, who were asked to name no more than 15 universities that they believed were the best for research and teaching in their field. American universities dominate the list. The universities at the top of the Times Higher Education World University Rankings have many similar qualities: they produce high-quality, groundbreaking research, deliver innovative education and have strong relationships with their local and global communities. But one university has a rarer attribute that makes these achievements even more impressive. KU Leuven is the only university in the top 50 of the table with an open admissions system, says its rector Luc Sels. “In Flanders, we have an open intake system so we cannot refuse students. If students want to come and take a programme in KU Leuven, they are all welcome,” he explains. This democratic quality is extended to the staff, too. Deans and the rector are not appointed but elected by academics. As a result, staff “feel really embedded in the system – they remain loyal to the system” and the university has a “very low degree of voluntary turnover of researchers and professors”, says Sels. KU Leuven is ranked 47th in the THE World University Rankings and its prestige is fast catching up with its performance. It is now in the 51-60 band of the 2018 THE World Reputation Rankings, up from the 71-80 position last year. It is once again the only Belgian institution to make the top 100 list. Sels says KU Leuven’s strength is down to four elements. First, the university does not specialise in one or two areas but is strong across a wide range of disciplines under 15 faculties, he says. “I think that’s very important, especially in the reputational survey, because that immediately implies that…we are quite well known in all the faculties of our international peers,” he says. Second, “one of the jewels in the crown of KU Leuven is…the enormous technology transfer capacity of the university”. This, combined with the university’s strong performance in European research programmes – the university is among the top 10 institutions when it comes to the amount of Horizon 2020 funding received between 2014 and 2017 – “largely determine our current international stature and positioning”, he says. Third, the university has the largest academic hospital in continental Europe. The university and hospital are “fully integrated” and a “single legal entity”, which enables the institution “to be strong from bench to bed and back”, says Sels. And fourth, KU Leuven’s international networks, including its League of European Research Universities membership and the resulting collaboration, is a “major trump card”, according to Sels. The University of Chicago remains in ninth place for the second year but it is joined by the University of California, Los Angeles (UCLA), which makes the top 10 for the first time since 2014, after rising four places. The UK has nine universities, one fewer than last year. Six of these, including all four of its London representatives, have declined. China and Germany jointly claim the title of the third-most represented nation, with six institutions each. But half of the representatives in each country have fallen down the list. In the case of Germany, questions have been raised over whether its Excellence Initiative has created meaningful differentiation in its higher education system. Meanwhile, signs of decline in China, after years of consistent progress, suggest that predictions of the country’s continued higher education rise may have been overstated or premature – although its two most prestigious players, Tsinghua and Peking, have maintained their positions in the top 20. It is a similar story in Japan, with the nation claiming five places, down from six last year, and four of these declining. The Netherlands also has five, but this is up from four last year and most of its universities have improved or remained stable. All three of Canada’s representatives have also made gains. But an Asian nation has once again proved what a significant higher education player it is on the global stage: Singapore. Its flagship National University of Singapore rises three places to 24th, while its younger neighbour Nanyang Technological University makes the 51-60 band, its highest ever position, up from 81-90 last year. Kirk D. Kolenbrander, vice-president of the Massachusetts Institute of Technology, which is ranked second for the third consecutive year, says the university’s strength is “bolstered by its people, first and foremost; by fostering a community that enables those talented individuals to thrive; and by an ethos of continuous assessment”. “People are the primary ingredient in success, and we work to create a community where they can be their full selves,” he says. “The people of MIT have been working across disciplines and breaking down silos since before ‘interdisciplinary’ was a buzzword. We try to remember that ethos in all areas of our work, including communications. Kolenbrander adds that ongoing critical assessment of its programmes also plays a vital role in “setting up people for success”. “Visiting committee members, from academia, business and industry, provide valuable counsel on current activities and future directions. The insights from that process and other efforts to continuously improve the institution ultimately strengthen our community and benefit the talented people who come here to change the world,” he says. Gene Block, chancellor of UCLA, the highest riser in the top 15, attributes the university’s strong reputation to two factors. “The first is a deep commitment to our mission as a public institution, dedicated to access and affordability as well as a focus on research and scholarship that can benefit society,” he says, adding that “many excellent faculty and students select UCLA over other prestigious research institutions” because of this commitment and that the university is “fundamentally linked to our communities locally and globally”. “Second, our location here in Los Angeles, a vibrant and diverse city recognised the world over for its spirit of creativity and innovation, has been a critical factor in raising the profile of our campus,” he continues. Distinctiveness in higher education may seem to be an elusive goal, given that most universities have very similar missions, but Carole Arwidson suggests that the answer may be for institutions at least in the US to find a niche among their local peers. “Most students [in the US] attend college within 100 miles of home, and so within that radius, for some students there are not as many options that are that similar to one another,” says the vice president and director of market research at The Lawlor Group, a higher education marketing firm based in Minnesota. Of course, reputation is a subjective indicator, which makes the World Reputation Rankings distinct from THE ’s other tables. But that does not mean that it is not important. A recent survey of more than 2,000 UK university students by students lettings app SPCE found that the reputation of a university was the second most important factor for them when choosing an institution, behind only the course on offer and beating the university’s perceived ability to boost later career opportunities. However, Arwidson says that universities today are in a tough marketplace. “Increased media attention on value, worth, and outcomes; governmental oversight; families’ ability and willingness to pay; and institutional challenges related to financial stability and vitality, product offerings, and the physical plant, among other things, all bear down on institutions and keep their leaders up at night,” she says. A 2016 survey of 216 independent college presidents in the US, from The Lawlor Group and RHB, another higher education marketing consultancy firm, found that 63 per cent said that families’ ability to pay was among their top external marketing challenges. Meanwhile, 68 per cent cited the costs associated with running their institutions to be among their greatest internal marketing challenges. And there are signs that a university’s prestige is now a more significant commodity than it was in the past. A 2017 survey of university board members and administrative leaders from United Educators, a liability insurance and risk management services firm for universities, found that 83 per cent believe that reputational risk is more important than it was three years ago. The perceived top reputational risks to their institutions over the last three years fell under the categories of campus climate (eg, diversity of students and senior administration), prevention and response to sexual assault, academic programmes (eg, quality of courses, students and faculty) and student behaviour (eg, campus safety and student mental health). But the top reputational risk going forward, according to the respondents, is higher education’s business model – an area including enrolment trends, fiscal management, staffing levels and tuition management. KU Leuven’s Sels agrees that financial issues, in particular around building infrastructure and establishing a long-term investment plan, are among the main challenges facing the university. However, when it comes to reputation, he says universities should think of this not as “an end in itself” but as a tool that “allows you to talk to the very best institutions worldwide”. The tendency for a university to receive reputation votes from within its own region or country varies enormously according to the location of the institution, these charts clearly show. First, the dotted graph shows the percentage of votes that universities in the top 100 of the Times Higher Education World Reputation Rankings 2018 got from within their own country. There is a clear pattern for Asian universities to receive more votes from within their nation, while North American institutions receive a mixture of votes from within and outside their country and universities in Europe tend to receive most votes from other nations. However, there are also exceptions, with a number of top ranking Asian institutions gathering a far bigger share of votes from outside their own country, reflecting the fact that some are in major international hubs such as Hong Kong and Singapore. 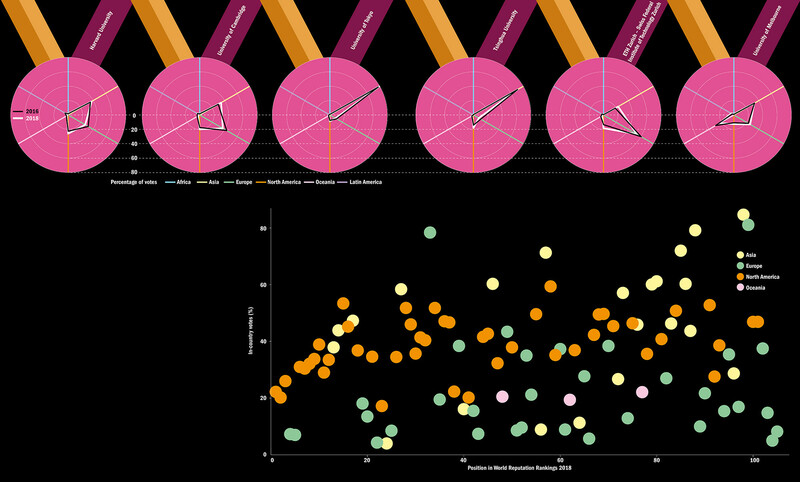 This pattern, and how it is shifting over time, can then be analysed in more detail by looking at the geographic origin of reputation votes in a number of the highest ranked universities. At some institutions such as the University of Cambridge and Harvard University there is a relatively even spread in terms of vote origin among academics in Asia, North America and Europe. But interestingly, there has been a shift from 2016 to 2018 for Harvard and Cambridge, with votes from Europe making up a smaller share of the overall total and those from Asia and North America increasing. The University of Melbourne also has a fairly even spread of votes, but here Europe is becoming a more important source and its home region of Oceania less so. Meanwhile, some other institutions have a more skewed profile. The University of Tokyo and China’s Tsinghua University both rely heavily on votes from within Asia, although Tsinghua is clearly starting to become a more well-known name in North America. And ETH Zurich relies more on European voting than Cambridge but again its reputation has shifted more towards other continents from 2016 to 2018. This article is published in collaboration with Times Higher Education.